“The Magpie is far too abundant” opined Boyd in 1951. What would he think now, with this as the seventh most widespread breeding bird in Cheshire and Wirral? Their population has probably stabilised now, however, after rising rapidly for many years. During the seven-year fieldwork period of our First Atlas the national index climbed by more than one quarter, but since about 1987 it has levelled off (Gregory & Marchant 1996), leaving the present figure about 10% higher than in 1984. Their distribution in the county shows minor changes since twenty years ago, with a couple of new breeding tetrads in Birkenhead docklands (SJ38J/ 39F), but still no place for it on Hilbre, and a noticeable loss from six tetrads in the eastern hills. According to the analysis of BBS transects in Cheshire and Wirral, their breeding population in the county in 2004-05 was 14,190 birds (10,650-17,720), an average of 22 birds per tetrad in which they were found. The validity of this survey for producing breeding population figures for Magpie is still being tested, however, because many Magpies live in non-breeding flocks (Birkhead 1991). These flocks make up one quarter to one half of the total population and are composed of one-year-old birds, too young to breed, and older birds that have not managed to displace, or replace, a territorial bird. Probably the main change that Boyd would notice from sixty years ago is the Magpie’s move into suburbia (85 tetrads) and urban areas (22). The habitat codes recorded in this Atlas comprised 44% farmland, 25% woodland, 7% scrub and 23% human sites. Some birds are now remarkably tolerant of man, and vice versa, although in some rural areas they are trapped in large numbers. Unless the culling pressure is intense, though, it makes little difference to breeding numbers because most of those taken are non-breeders and a territorial bird that dies is replaced almost immediately by a member of the non-breeding flock, virtually always within 48 hours and sometimes the same day (Birkhead 1991). In rural areas, Magpies actually choose to nest near houses, probably to reduce the likelihood of predation by Carrion Crows, which are much more wary of man! By far the easiest way to prove Magpies breeding is by seeing their enormous domed stick nests, usually close to the top of a tall tree, which take them three weeks to build, usually during March and often starting in February. They have shown a strong trend to earlier breeding: analysis of the BTO nest record data show them laying eggs a whole month earlier in 2005 than in 1968, typically starting in late March nowadays. Nests were recorded in 226 tetrads but, once the leaves are out, they can be surprisingly difficult to see and surveyors visiting a tetrad for the first time in late April or May could have missed them. No matter, because recently fledged young are noisy and obvious by their short tails as they harass their parents for food for several weeks and they seldom leave the 5 ha breeding territory: RF was the code for confirmed breeding in 220 tetrads. Magpies will eat almost anything but adults take mostly invertebrates to feed their young. Around Manchester, beetle larvae, adult beetles, ants and leatherjackets were the main prey (Tatner 1983). They find most of their food in grassland, either agricultural fields or urban greenspace. 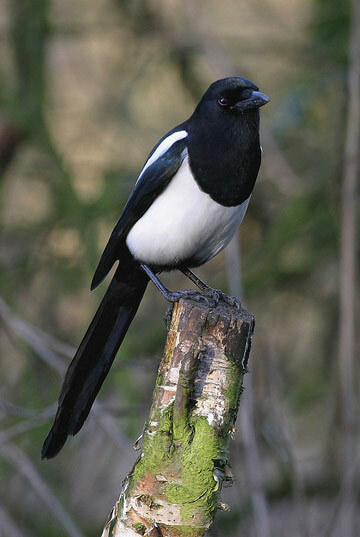 Many birdwatchers hate Magpies because they occasionally take eggs and nestlings of smaller birds, but they seldom comprise much of a Magpie’s diet and several studies have shown such predation to have no effect on the populations of other birds (Gooch et al 1991).